The Great Plains region has cast an indelible image on the panorama of American culture. The vast expanses of land encompassed in Kansas, Nebraska, North Dakota, Oklahoma, South Dakota and surrounding areas have been home to an often overlooked cultural diversity. The Sun Dance of the Kiowan tribe, the folk ballads of Woody Guthrie, the fiction of Willa Cather and Louise Erdrich, the Great Plains school of architecture, bierocks (a.k.a. 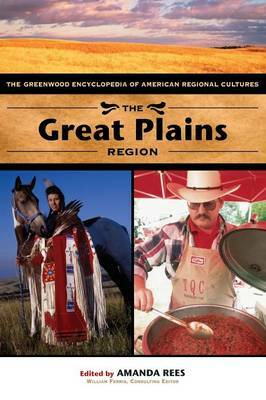 savory pie sandwiches), Buffalo soldier fashion, Territory Jazz and Native American hip-hop-all these elements and countless other have contributed to the patchwork of Great Plains regional cultures. Detailed narrative chapters on thirteen categories, each with illustrations and sidebars, of Great Plains culture provide an unprecedented look at the many ways in which America's Heartland have served as an oft-unheralded cross-section of America's melting pot, and each concludes with recommended further resources on the topic. This volume also includes an introductory essay on Great Plains regional identity as well as a timeline, bibliography, and index. The Greenwood Encyclopedia of American Regional Cultures is the first rigorous reference collection on the many ways in which American identity has been defined by its regions and its people. Each of its eight regional volumes presents thoroughly researched narrative chapters on Architecture; Art; Ecology & Environment; Ethnicity; Fashion; Film & Theater; Folklore; Food; Language; Literature; Music; Religion; and Sports & Recreation. Each chapters includes a Resource Guide with a carefully selected list of print publications, Web sites, organizations, as well as festivals, recordings, videos, special collections, and other sources for information when appropriate. All books in this set have a volume-specific introduction, as well as a series foreword by noted regional scholar and former National Endowment for the Humanities chairman William Ferris, who served as Consulting Editor for this encyclopedia.